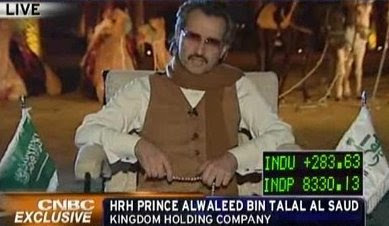 The prince is discussing his ownership of Citigroup which is reported at 3.6%. The Saudi royal family is the single largest shareholder of Citigroup. For readers who might be aware of the teaching of the Koran on usury, it does seem contradictory to seek ownership of the Western bank which practices banking in contravention of the Koran. The beads held by the prince might have been the basis from the Rosary which began to emerge as a popular devotion in the decades following the First Crusade.